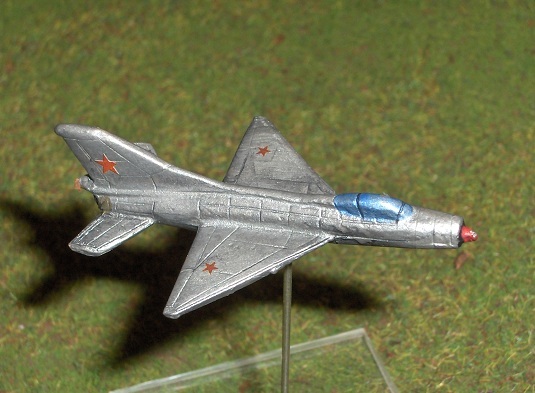 Note: Thie Soviet section has been broken up into several subsections, becasue the original had gotten far too large. 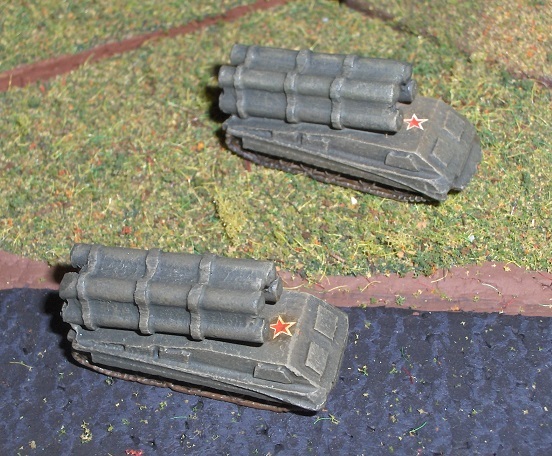 A note on the paint color of Soviet vehicles: Most of these shots look less green and more brown than they appear in real life (I assume it is due to the flash, I don't really know). 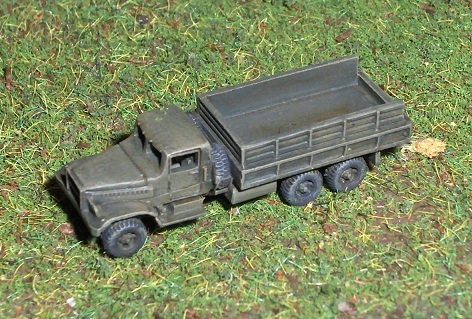 However, I have not finished most of my vehicles in the black-green frequently seen on 1980's Soviet vehicles on parade. 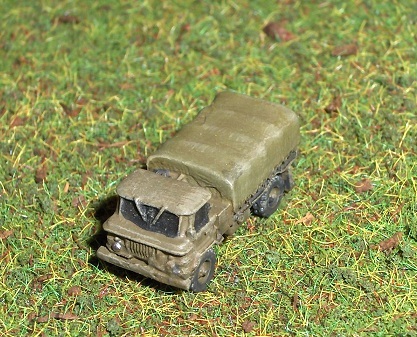 Rather, I chose a greenish-khaki (Soviet Khaki #2, PollyScale) that seems to be a far closer match to the way Soviet vehicles actually appear in the field. 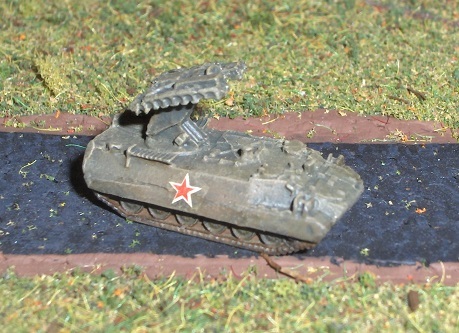 When I have used black green, I have drybrushed Soviet Khaki onto them. I have not painted anything in the various light green shades sometimes marketed as WarPac paint, as I have yet to see decent photographic evidence that it was ever used outside of parades. 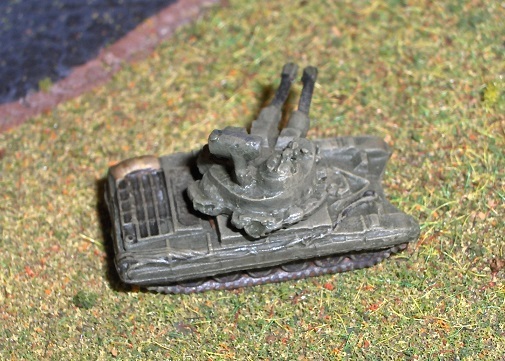 A better model than GHQ's, but the barrels are prone to bending. I wish there were scale crew figures. 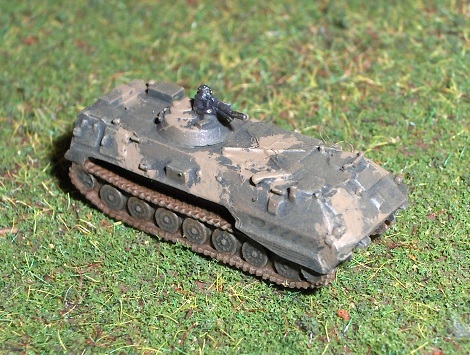 Another shot of a GHQ ZSU-23-4, in a different paint scheme. 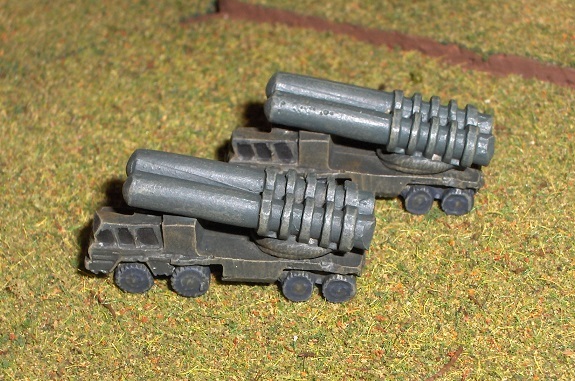 I used ModelMaster Jet Exhaust Pipe for the guns, to good effect. 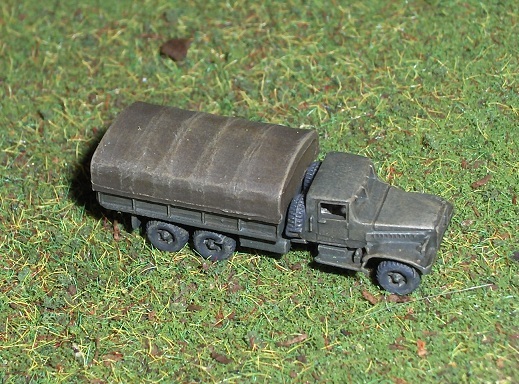 A truly beautiful model from GHQ -- the detail level is high, and it is actually quite a large vehicle. 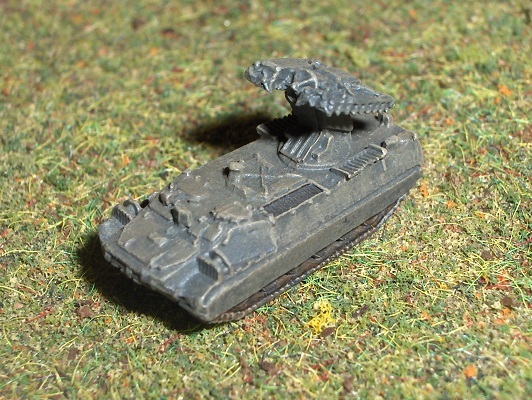 This is a GHQ BMP-2 with a dual 23mm gun mounted in place of the turret. 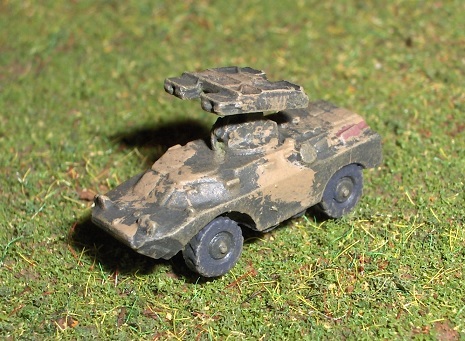 Part of GHQ's 3rd World Warriors collection. 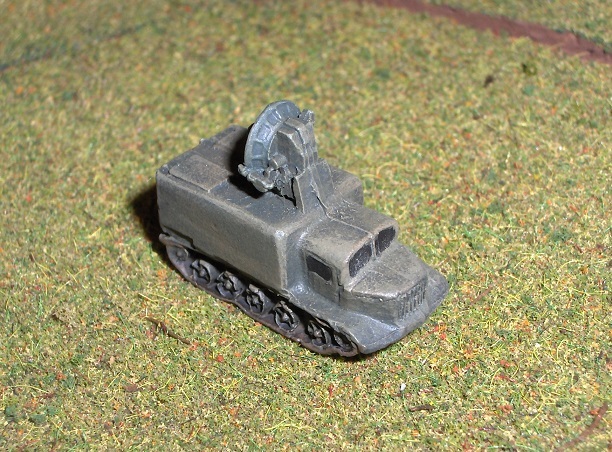 Similar to the above model, but mounted in the bed of a GAZ-66 light truck. 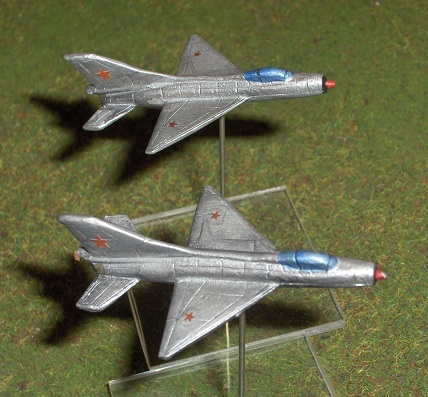 I use these with my Soviet Airborne units. 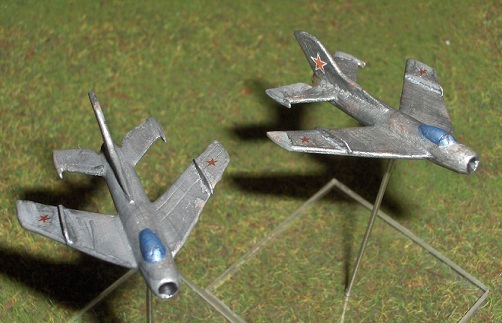 These are fantastic models from CinC -- true works of art. 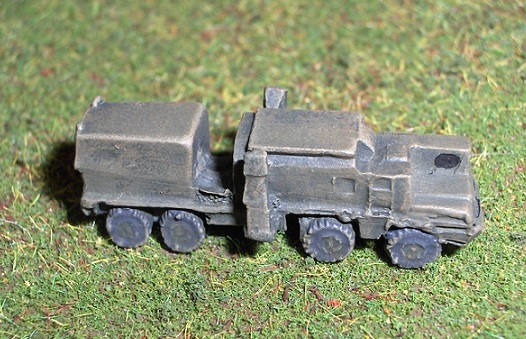 Very good models from Scotia, although all that I ordered were poorly cast. 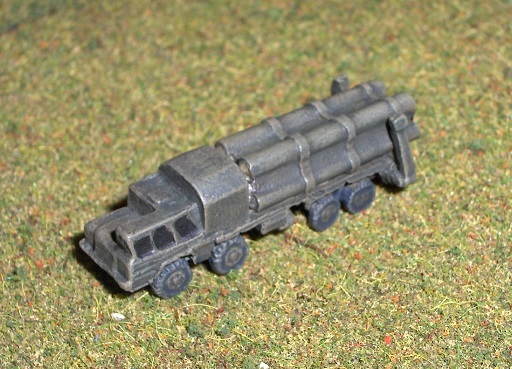 This is the reload vehicle. 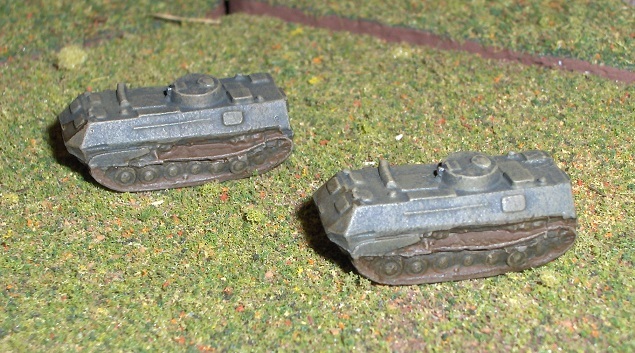 These are some of the nicest models GHQ makes, and I gave them a decidedly mediocre paint job. 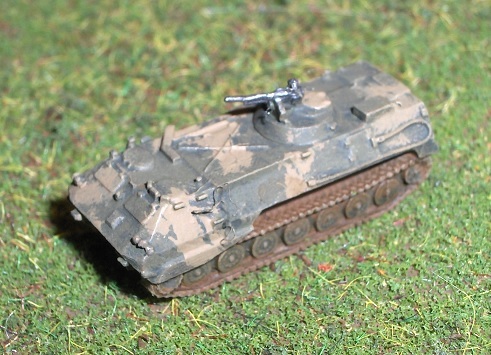 Another shot of an SA-8 in a slightly different paint scheme -- a bit lighter. The early version of the SA-8. 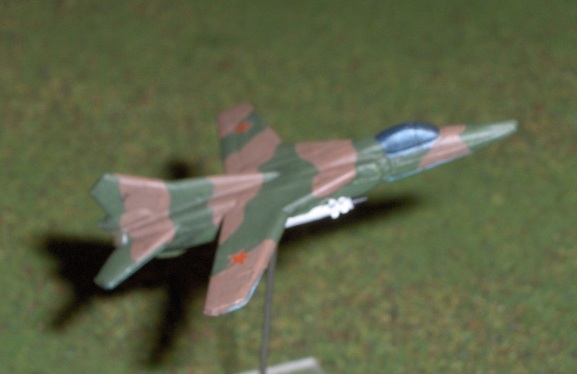 Not a fantastic model, likely from Skytrex. 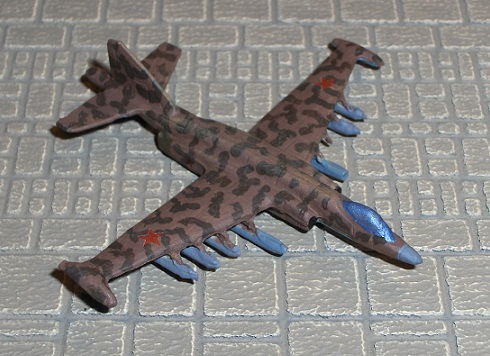 A decidedly mediocre model, depicting the SA-10 SAM on the move. 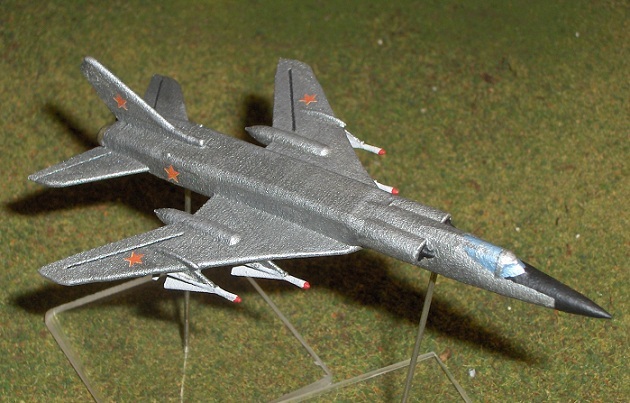 The SA-12b is the long-range version of the SA-12 Grizzly. 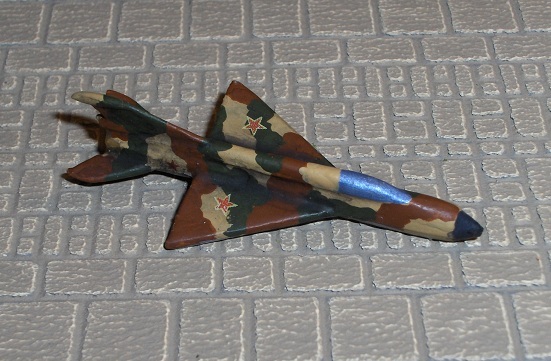 This model was cast by ISM in the late 1980s or early 1990s when only partial information was available on the missile. 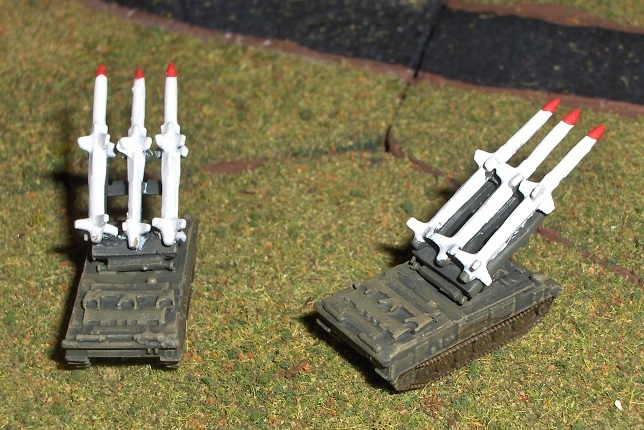 I have recently found an old US Department of Defense mockup of what they thought the missile battery looked like -- and these models are exact copies. 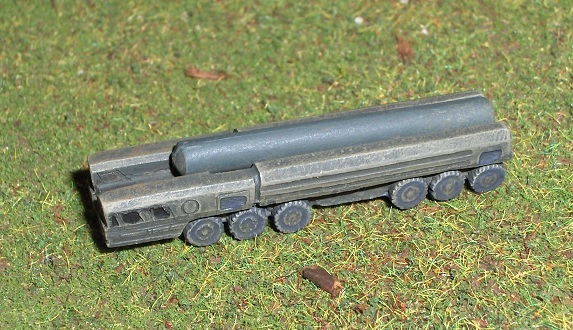 While it is not remarkably accurate (the ribs on the launch vehicle are too large and the radar mast should be square and articulated) it is still a unique, interesting model and a worth addition to any army. The full set from ISM included six vehicles -- 2 launchers, 2 different radar vehicles, a command vehicle and a reload vehicle. 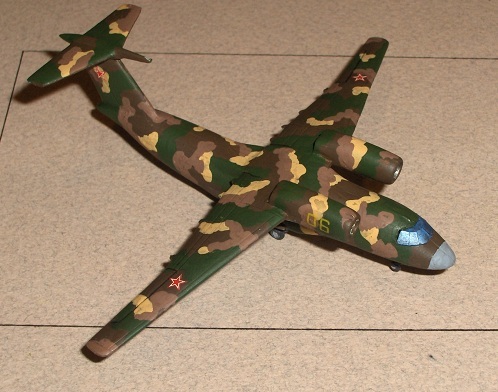 Another GHQ SA-13 in a different scheme. Well, sort of. I believe this is ISM's speculative version and it is just way off the mark. 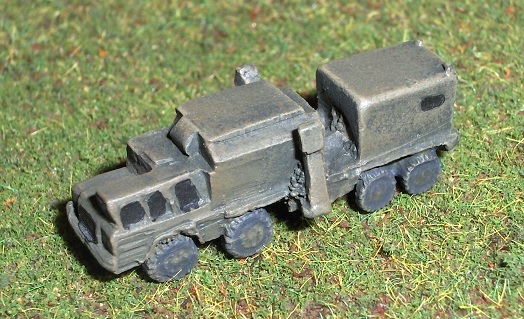 Same model, but in towed mode. 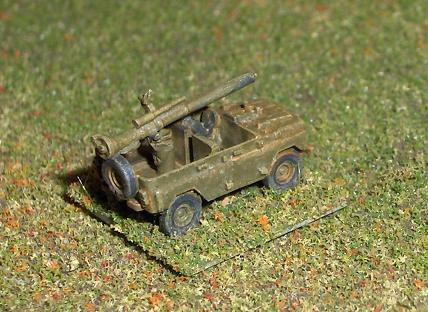 A finely detailed model, but in some ways just too small... difficult to assemble and the barrels bend easily. 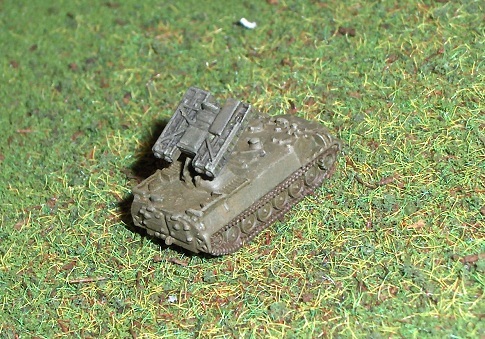 I'm not sure who made this, but I think it is supposed to be a ZPU-4. It is, however, probably twice the size it should be. 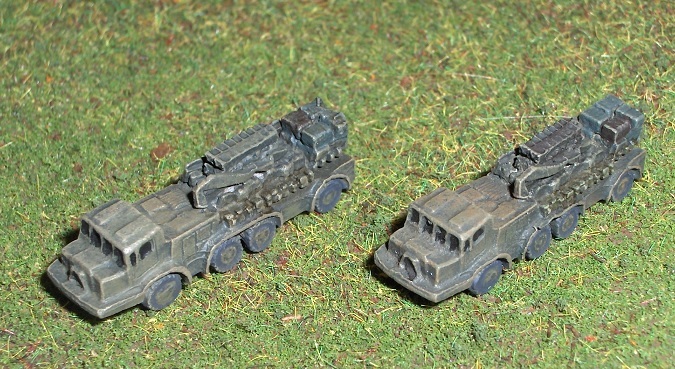 CinC makes an absolutely spectacular line of Soviet-era radar vehicles. This is a Long Track air defense radar. 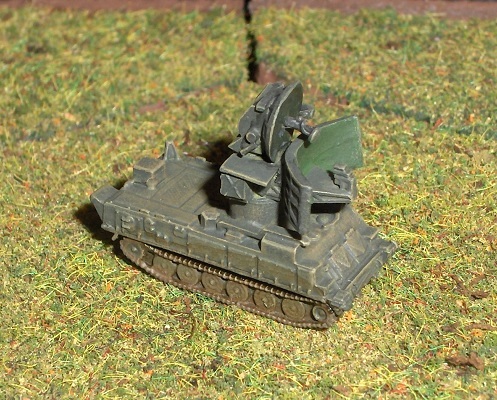 I wasn't sure how to paint the radar dish, which is a superstructure in real life. If I was bold, I would replace it with brass mesh. 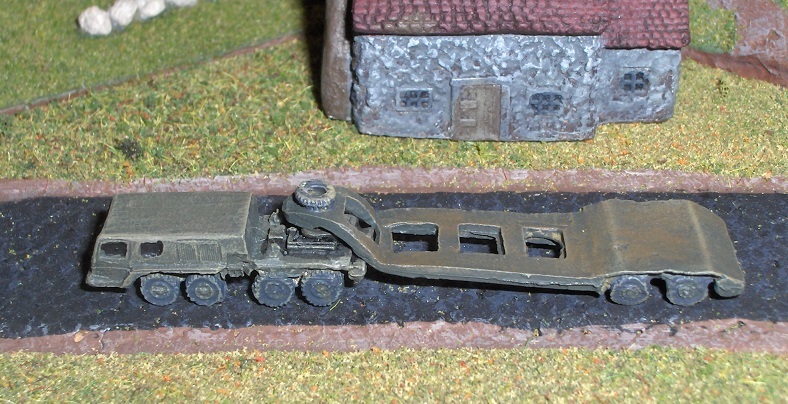 A significantly better model than CinC's, although it does not have removable canvas. 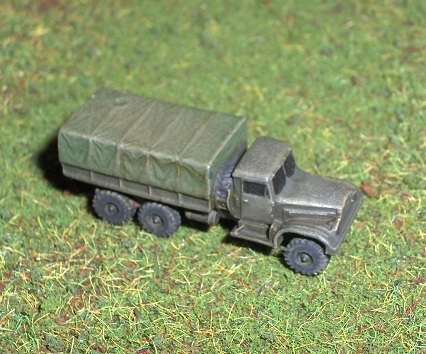 This came in a pack labelled Gaz-66 airborne version... Don't know the manufacturer, but wheels make me think Skytrex. 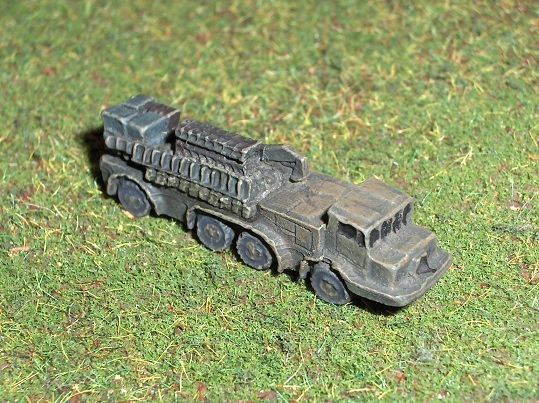 This would appear to be an older version of the KrAZ-225B... though I am not sure. The above model could be mis-identified. 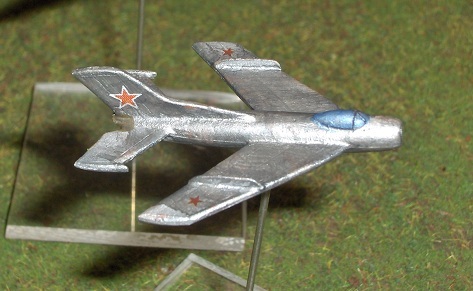 A fine model in multiple parts that can be assembled either covered or uncovered. Looks to be URAL-375 based? Either Scotia or ISM, but probably Scotia. Antenae are 20 gauge wire. This is one of the sets from ISM that included a number of vehicles in a single package -- a very effective way to sell them in my opinion. 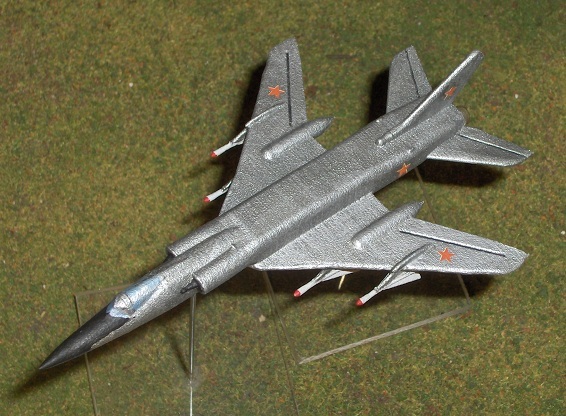 An excellent model, and surprisingly large. Well worth the $7.00 per model it costs. 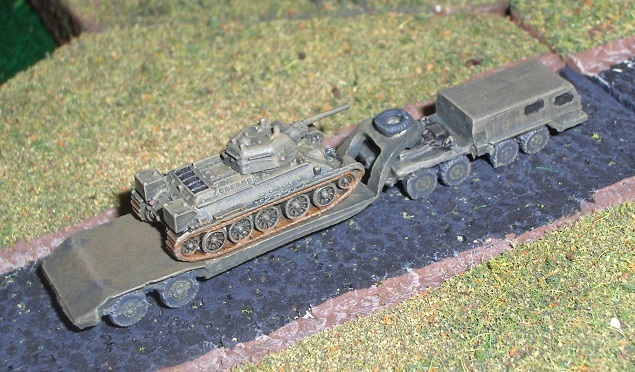 Can be built in either transport mode (as show here) or deployed (which I opted not to build). 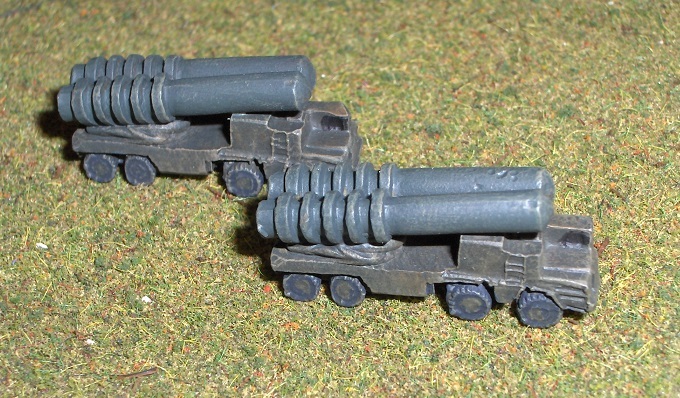 Another conversion, antennaes and gun added, by persons unknown. I believe the manufacturer to be Scotia. Obviously, model isn't in the same league as its GHQ equivalent. 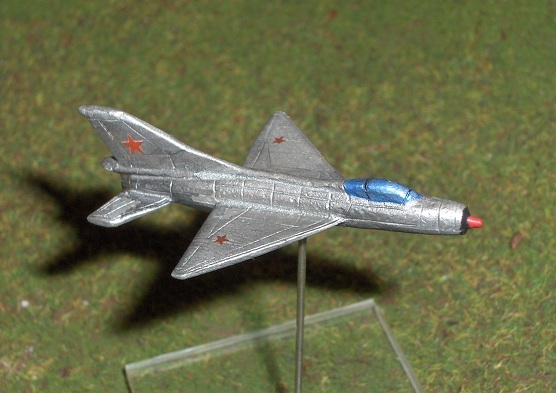 This is the GHQ version, which makes me think the above model is missing the cover. 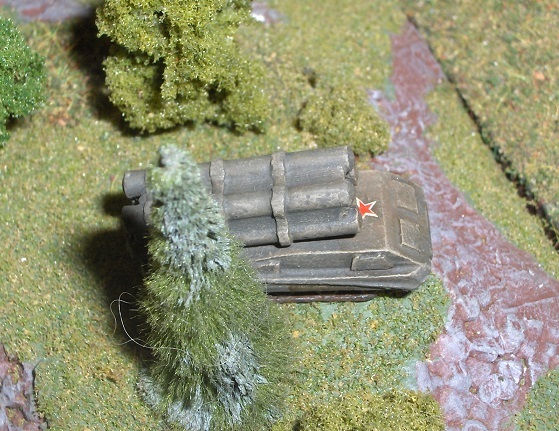 Another version of the URAL with the jet engine on the back. I believe this one is from Scotia. 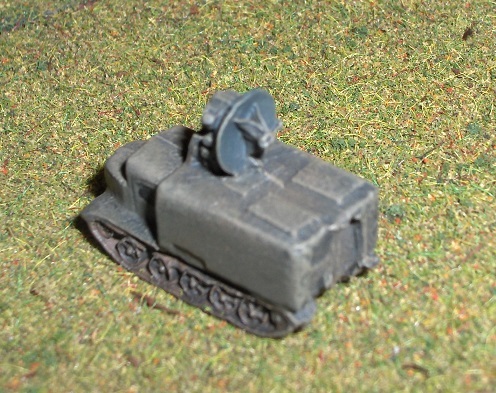 GHQ Infantry from the Soviet Infantry and Soveit Heavy Weapons packs. 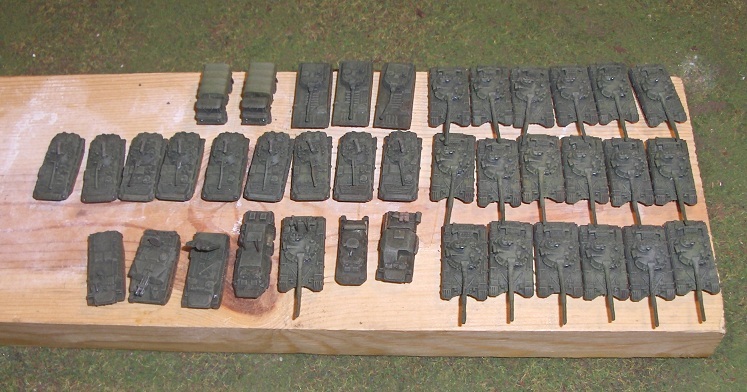 These are a real bargain, and give you a large number of interesting figures for relatively little money. 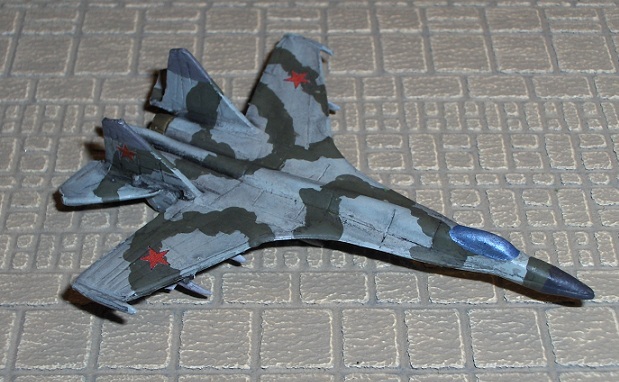 While not as scale-accurate as CinCs, they are far sturdier and more detailed. They are also significantly ahead of H&R. 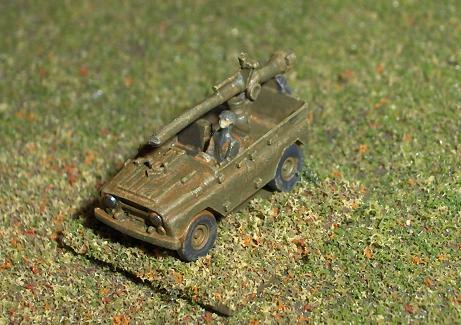 Ok, these are GHQ Soviets again, this time painted up as paras. Although it doesn't show up well in the photos, they have khaki uniforms with a lighter camo pattern. 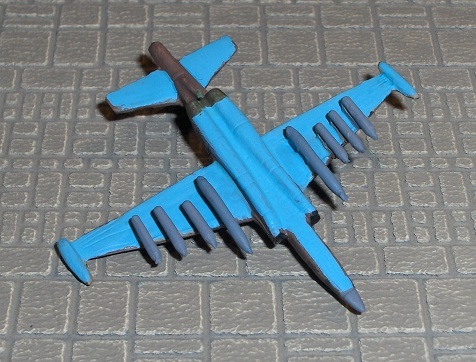 A super ground attack aircraft from GHQ, although assembly is a bit difficult -- tough to keep the rocket pods attached. I need a better photo, as this one is way too washed out. 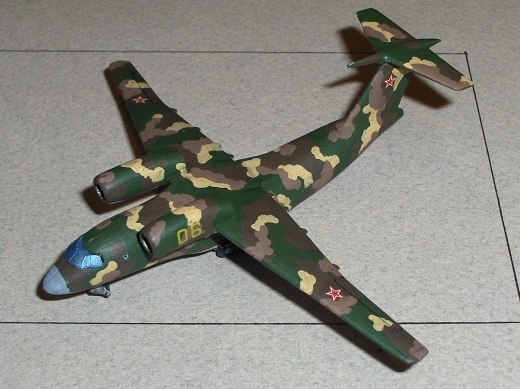 A surprisingly good model from H&R, with armament options and a one-piece propeller. GHQ's excellent early Hind. 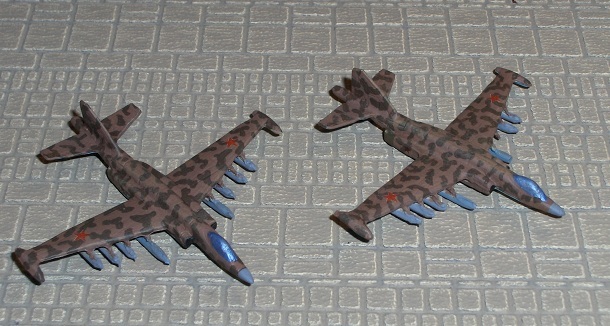 I haven't figure out how to appropriately attach the rotors yet. I used a new inking technique on this model. Skytrex model, heavily rebuilt by me. An absolutely massive model. As far as I know, no longer in production. 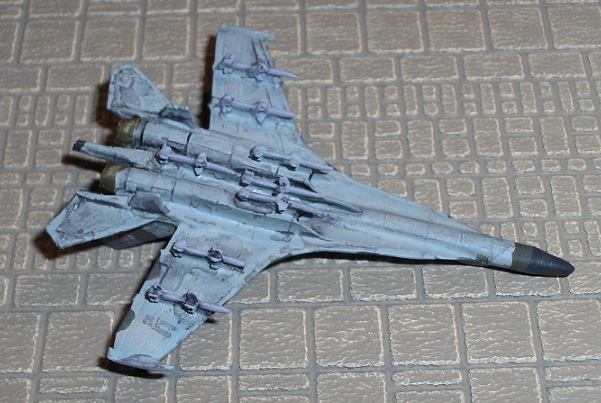 A fine 3-D printed model from Shapeways, one that is absolutely huge, but fairly lightweight because of the material. 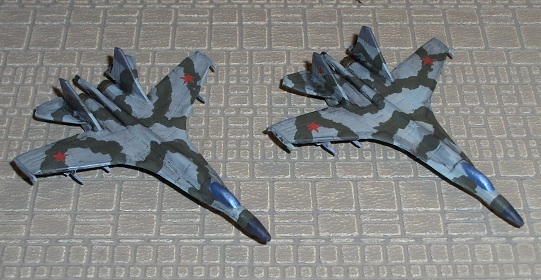 The surface is a little rough, but the missiles are extremely well done. Skytrex model. 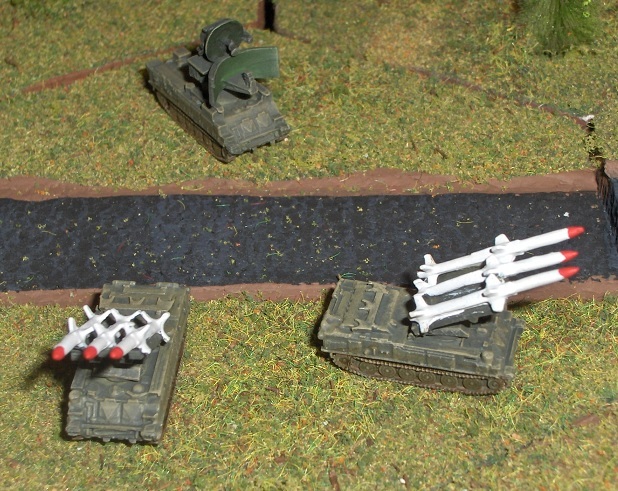 Kitted out with CinC Soviet missiles. Admittedly, not a great shot. This model is very, very small -- seems closer to about 1/320th. 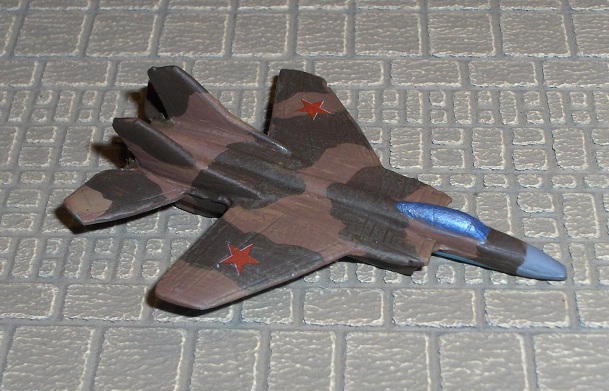 In retrospect, I'm not even sure this is a Mig-29. 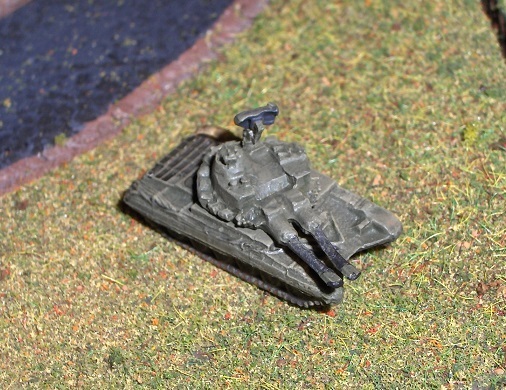 ISM modern Soviet tank company -- composed of FSTs (Future Soviet Tanks), probably pulled from the Pentagon's various publications. This unit came boxed together from ISM, and I picked it up off of eBay. 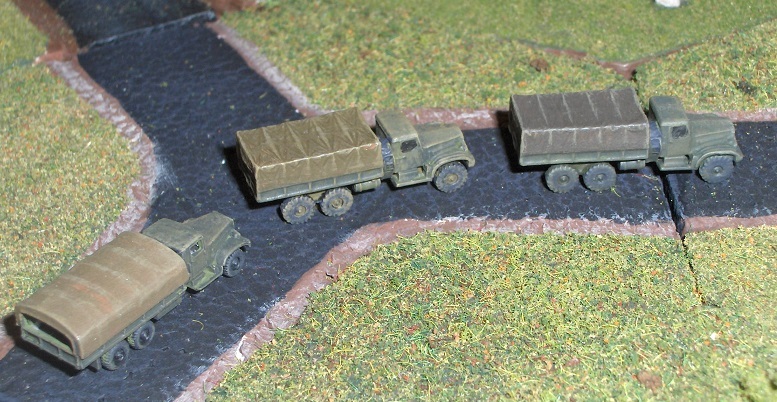 It includes 11 tanks, a BREM-1 recovery vehicle and (from left to right, bottom row) a GAZ-66 maintenance truck, heavy fueler, MTLB engineer version, BRDM-2, BRDM-2 chemical recon vehicle, and BTR-80 command vehicle.